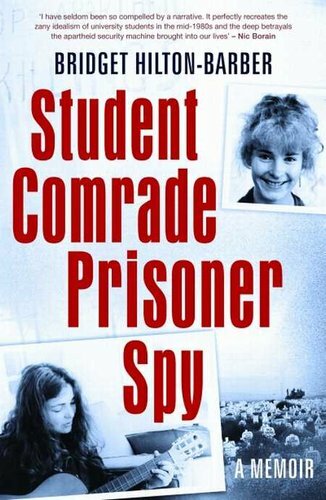 “Student Comrade Prisoner Spy” is an invaluable look into the mind of the apartheid animal through the eyes of a young woman who was both liberated and bewildered by a journey that was precipitated by her exposure to various freedom movements at university. “Student Comrade Prisoner Spy” is written with a prose like a machine-gun’s bullets – fast and sharp; indeed, Hilton-Barber can describe more in a few words than most writers can in a paragraph. It is this prose style which yanks the reader along on a disturbing rollercoaster of a ride, while somehow creating the feeling that Hilton-Barber is in the seat next to you. The writer has immersed herself in this book. This might sound redundant for a memoir, but she exposes herself, her thoughts and her emotions with an honesty that can only be described as brutal. She is open about her initial naiveté and direct about her political development, while her incarceration and subsequent quest to put her demons to rest draws the reader into a mind painfully disturbed and desperately seeking solace. It is a pity, then, that one gets the feeling that part of the reason for writing the book was to “respond” to the book written by her friend and comrade, and ultimately her betrayer, Olivia Forsyth. Forsyth was a complicated person who became prominent in many of the student groups advocating and working towards a free South Africa. It later emerged that she was working on behalf of the Security Branch and supplied information which would have resulted in the jailing, torture, or worse, of people allied to these groups. It is this betrayal and apparent lack of remorse that Hilton-Barber is unable to forgive and seems to have motivated the writing of the book to a greater or lesser extent. Nevertheless, the motivation behind the writing of “Student Comrade Prisoner Spy” should not detract from what is a powerful story told by a talented writer who has turned her most personal experiences inside out for a book that is both a thundering good read and a thought-provoking and emotional exploration of a time where evil was the norm.